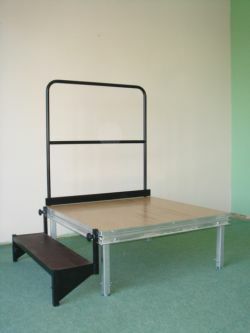 Our extremely popular, durable and easy to use 1m x 1m aluminium-framed, beech veneered (or stained black) Performa Conductor's Platform is available in any height required using easy-to-remove leg sets. Optional stair treads, safety backrail (single sided or curved) and fabric valance make this podium an attractive addition to any stage. All accessories (legs, backrail, stairs & valance) attach effortlessly without the need for any tools! Ideal for choral or orchestral Conductors who are either on the move or just staying put.